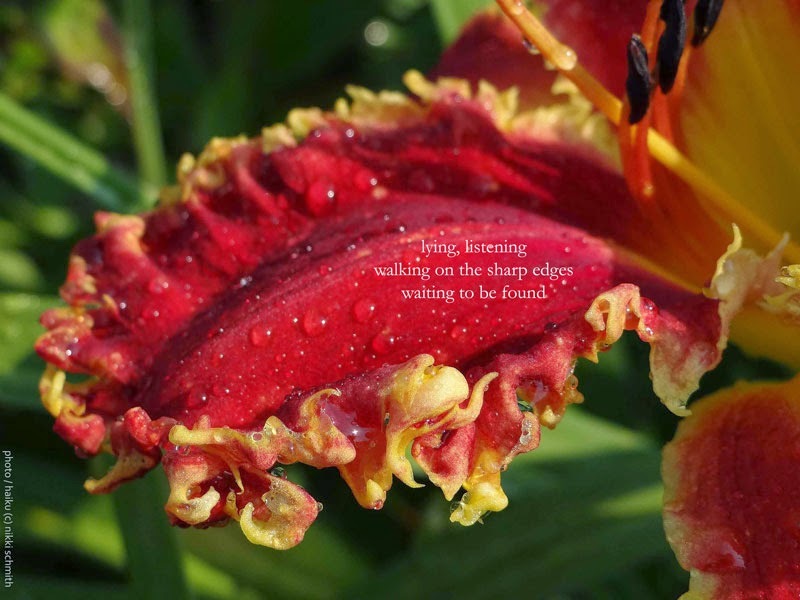 <posted October 23, 2014> This is a haiku featuring the daylily H. 'Happy Holidays To You' by Mike Holmes. Mike and I share the same birthday and we share a similar extreme taste in daylilies. His adorable wife Sandy is also a daylily hybridizer, and she will be speaking at the Greater St Louis Daylily Society banquet next month! HOORAY! I have been in two conversations this week where it was pointed out I might be thinking too far "outside the box." Why do we have to think "outside the box?" What if we aren't completely sure of what is "in" the box? Aren't our skills better utilized perfecting the box, then what is in it, THEN work on what is outside of it? What if the person who presented the notion that we are more courageous, productive, brave, creative if we are OUTSIDE of the box just couldn't figure out the box so they got out of it? What if they just didn't understand how to function in the box? I obviously have more questions than answers today. This weekend is the American Hemerocallis Society Fall Board Meeting and I'm traveling to Louisville, Kentucky to be a part of it. I am the current Director for Region 2, so I must go and represent the near 2,000 AHS members in Illinois, Indiana, Wisconsin, Michigan and Ohio. Some of these folks are among my favorites in all of daylilyland and I am so excited to see them! Enjoy this Indian Summer, y'all!